Similar to natural pure fancy purple diamonds, natural pure violet diamonds are exceedingly rare, they are arguably even rarer than purple diamonds and are seldom found in sizes larger than one carat. In fact, fancy violet diamonds are typically very small, routinely ranging from 0.10 carat to approximately 0.30 carat. Pure violet diamonds without secondary modifying colors are even harder to find, as most are paired with grey or blue. While some colored diamond industry professionals use the words "violet" and "purple" interchangeably, violet diamonds are a distinct color group that should not be confused with purple diamonds, physically and in discussion. Violet diamonds will appear more blue-grey to the eye while purple diamonds appear red or pinkish. Natural violet diamonds are extremely rare and belong to the purple diamond family. 0.18 ct Fancy Dark Violet diamond and a 0.13 ct Fancy Intense violet diamond. The color appears as a combination of blue diamonds and purple diamonds, although it is a color in its own right, and comes in different hues and intensity. Many of the world's violet diamonds originate from the Argyle Mine in Kimberley, Western Australia. Left to Right, 1st row: Fancy Violet Gray, Fancy Dark Violetish Gray, Fancy Deep Violetish Gray, Fancy Dark Violet Grey. Left to Right, 2nd row: Fancy Gray Violet, Fancy Grayish Violet, Fancy Intense Violet, Fancy Deep Violet, Fancy Deep Gray Violet, Fancy Deep Grayish Violet, Fancy Dark Gray Violet. Left to Right, 3rd row: Fancy Deep Violetish Blue. Pure violet with no secondary hue almost never occurs in nature, and when it does, these diamonds appear only in small sizes. Even though this is very rare, it is not considered as rare as fancy red diamonds and fancy blue diamonds. The violet colored diamonds found in nature usually appear with grey or blue as a secondary hue, and are also very beautiful although not always as expensive. 0.33 ct Fancy Gray violet diamond, 0.33 ct Fancy Gray Violet diamond, and a 0.33 ct Fancy Gray violet diamond. When the color appears as a modifying color in a secondary hue, it can be either violet or Violetish (i.e. 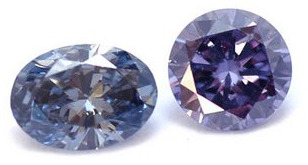 Fancy Violetish Blue or Fancy Dark Violet Grey), depending on how the violet modifying color appears in the diamond. Their color is related to Hydrogen, but the exact mechanism is as yet unknown. They are often very small and diamonds greater than 1 carat are extremely rare. 0.56 ct Fancy Dark Violetish Gray hear shaped diamond, 0.25 ct Fancy Violet Gray diamond heart shaped diamond, and a 0.17 carat Fancy Deep Violetish Blue Argyle diamond. The intensity levels that fancy violet diamonds appear in are Fancy, Fancy Dark and Fancy Deep, and very few in the Intense classification. A Fancy Deep Pink pear shaped diamond and a Fancy Violet pear shaped diamond. Violet diamonds come from the Argyle mine in Australia, which is the world's biggest pink diamond and purple diamond mine. As of yet, there are no famous violet diamonds. Fancy Violet And Fancy Blue Diamonds. As with several other natural fancy colored diamond groups, the presence of a trace element (in the case of fancy violet diamonds is hydrogen) in the atomic lattice, is responsible for their particular color. The cause of color in violet diamonds is markedly different from that of purple diamonds, which is due to plastic deformation, or mutation of the atomic lattice. Violet diamonds and purple diamonds therefore consist of two separate colors. The further along this spectrum you go, the richer and more intense the violet is to be seen in the diamond. The more intense a diamond's color saturation, the more it will be worth. A Fancy Intense Violet diamond will be worth considerably more than a Fancy Violet diamond, although both are valuable in their own right. Tone refers to the lightness or darkness of a violet diamond, and the continuum in between. GIA grading does not make a distinction in tones, but to the eye a stone with darker tones may appear more intense in color. For someone looking for the appearance of a Fancy Intense Violet diamond without the price tag of one, a good option may be a Fancy Violet diamond with a darker tone. Violet diamonds do not have a marked tendency to exhibit fluorescence to UV light. In the final analysis, the enhancement to a stone's aesthetics that fluorescence offers is entirely subjective. Natural violet diamonds tend to have inclusions and therefore generally fall in the SI1 to I1 range. Violet diamonds with clarity grades of VS2 or better are rarer. Natural fancy violet diamonds can be found in virtually all shapes, including radiant, marquise, pear, oval, heart, cushion and the classic round brilliant cut. In the case of violet diamonds, a round brilliant cut does not necessarily desaturate color as they usually have relatively darker tones than other diamond colors. Take note of uneven color distributions as well (these will be noted on your GIA certificate), as they can certainly affect a diamond's appearance and value. Natural fancy violet diamonds are extremely valuable. Even more valuable are those that are a pure violet color without any secondary modifying color. Violet diamonds tend to be found coupled with grey or blue as secondary colors. The modifying colors tend to devalue such violet diamonds, but they are nonetheless rare and possess high value in their own right. Violet diamonds of any kind are typically small and rarely, if ever, exceed one carat. If a violet diamond larger than one carat should surface on the market in the future, there will be a hefty price tag attached to that rare commodity. A colored diamond is generally rare when it exists as one color without any modifying colors. Violet diamonds can be found paired with blue and grey. It is more common for violet to serve as a secondary color modifier, such as a diamond graded Fancy Violetish Blue or Fancy Violet-Grey, than for it to be the dominant color in a diamond that is modified by another color. The majority of violet diamonds originate from the Argyle mine, the same mine made famous worldwide for its production of fancy pink diamonds, in Kimberley, Western Australia. Violet diamonds rose to prominence when they were discovered in Australia in the late 1980s. Argyle violet diamonds tend to exhibit conspicuous overtones of blue or grey, affirming the complete dearth of pure violet diamonds.